Enter, the School Crossing Guard. 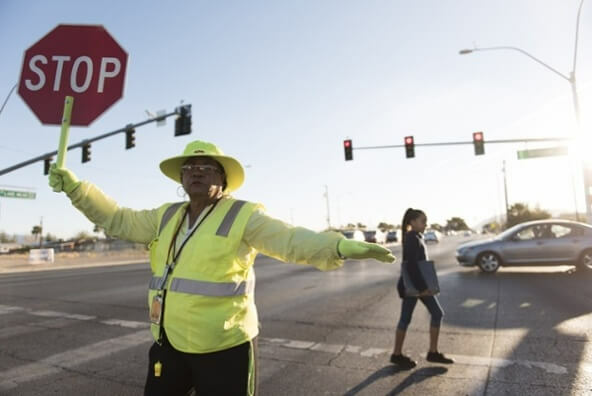 There are no national standards for where and when a school crossing guard should be posted near and around schools, but many states have their own regulations on the matter. In California, crossing guards are assigned to areas where a minimum of forty students cross the street over the course of two hours. The state of Arizona mandates guards at 15 MPH School Crosswalks when the crosswalks are not adjacent to the school, and in the city of Phoenix, guards are required for elementary school crossings. The age of the students who are crossing. The width of the street and the number of lanes of traffic students must cross. The sight distance at the crossing. Presence of traffic control devices, including traffic signals, signs and pavement. The speed of vehicles at the crossing. Volumes of traffic and pedestrians. The attendance boundary and walk zone for each school. The distance the crossing is from a school and the type of adjacent land use. Crash history of the crossing. A successful school crossing guard program involves a number of stakeholders, including law enforcement agencies, traffic planning departments, parent groups, and of course the school itself. As the first person into the street and the last person out, the crossing guard must be a reliable and attentive custodian of safety. School zone signage / pavement markings. Proper use of safety equipment and purpose of traffic signs / signals. Methods of signaling drivers and taking advantage of traffic gaps. Crossing procedures and ways to teach them to children. Traffic factors / potential traffic hazards. Procedures for crashes involving crossing guards and children.